I take back every complaint I’ve ever voiced about my husband. While I’ve been down for the count for the past three days with strep, he has stepped up and handled absolutely everything with our kids. He has fed them three meals plus snacks, cleaned up after them, gotten them dressed, taken them to my parents’ house for Easter dinner without me, and played with them, keeping them busy and happy. When I finally emerged from our bedroom yesterday, I croaked out a question to him from something I had heard while I was sleeping. He started laughing and told me how it all unfolded. My husband told both of our boys to grab their baseball gloves and join him outside for a catch. Then he told our daughter to put her shoes on, too, so she could kick around the soccer ball in the yard while they played. “Can I bring my phone, too?” she asked. “Sure,” he replied. Despite all of the cool made-for-kids toys that clutter our house. 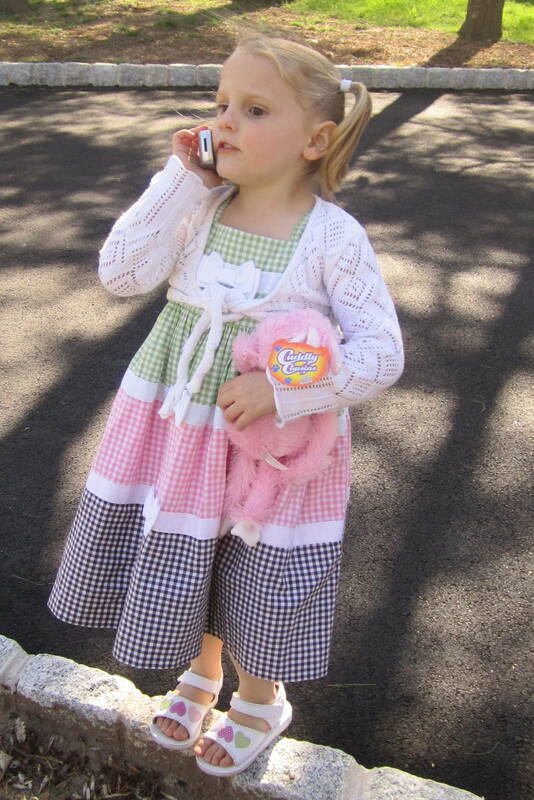 My daughter’s current favorite thing is our old cell phone. It is a real cell phone, but one that is years old with no service on it. We discovered that keeping these around the house means we don’t have to buy the Elmo and Princess versions that make horrible, high-pitched, make-your-ears-bleed sounds. So she pulls on her shoes and goes out to play. After losing interest in kicking the ball around, she began strutting her three-year-old body around the yard, chatting on her phone. “Who are you talking to?” asked her Daddy. “Nathan,” she replied, referring to the youngest son of one of our best friends. “Uh Uh. No you’re not,” my husband told her. “Yes I am!” she giggled in return. “No. You are not allowed to call boys on the phone,” said my husband in his Father Knows Best voice. “Yes, I can! I want to talk to Nathan!! !” she screamed as she stomped in protest. “NO!!!!! I want my phone!!!!!! !” she sobbed in full-blown temper tantrum mode. At this point, my husband took her inside and sent her upstairs to her room to calm down, while he held onto the phone until she was ready to obey Daddy’s rules. “So that’s the part that you probably heard while you were sleeping,” explained my husband, laughing. I coughed out a laugh and looked at him incredulously. I shook my head and shrugged my shoulders, chalking it up to different parenting styles. Later, our daughter walked into the room, chatting on her play phone while my husband and I were sitting there together. “Who are you talking to?” my husband asked her. “Great! Have a good talk. But who can’t you call?” he prompted. “Nathan. Because I’m not allowed to talk to boys on the phone,” she replied, as if she were a programmed robot. Then off she went have a great fake discussion about ponies and playdates with her girlfriend, happy as can be. ← “The Easter Bunny is Coming to Town” by Rankin Bass on YouTube! !